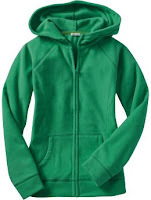 Saturday only, Old Navy has men’s & women’s Full Zip Fleece for only $5! Use this $5 off any $25 purchase coupon to make it even better. To find the coupon, click on the December 7th box. Move the yellow hat to the girl inside the ornament the coupon. When I got there at 9:10, I was told all the zip front hoodies had already sold out, but I was still able to pick up a cute v-neck fleece sweatshirt for $5. THE SALE IS NOT THE HOODIE!! It is the men and women's performance fleece on sale for $5(and only certain ones- quarter zip, some full zip front)… the hoodies are $12 for men and $10 for women… when I got to Gresham's Old Navy- the women's had been cleared out, at 7:11AM!! but there were still some men's. Use the 25% off any item coupon from last weekend's Sunday paper to make one of these even cheaper. Great. Thanks for posting this. I plan to buy a few of these for Christmas presents! Great deal!